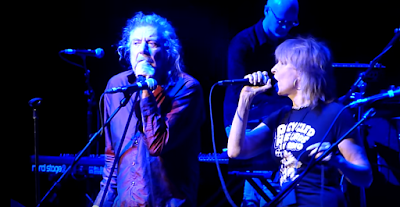 Robert Plant was joined by Pretenders vocalist Chrissie Hynde for a pair of songs during the rocker’s December 8 show at London’s Royal Albert Hall, and video from the event is streaming online. Hynde arrived on stage during the encore portion of Plant’s gig to perform their cover of the Ersel Hickey rockabilly classic, "Bluebirds Over The Mountain", as featured on the Led Zeppelin singer’s “Carry Fire” album. Alongside the Sensational Space Shifters, the duo then delivered the Pretenders 1984 track, “2000 Miles”, with Plant telling the audience before he handled backup vocals: “On a wing and a prayer, we have a beautiful song for you that only Chrissie can sing right." The London show marked one of the final dates of a month-long UK tour by Plant, which will wrap up in Birmingham on December 12. After the holiday season, Plant will return to live action with a brief spring tour of North America that is set to begin in Raleigh, NC on February 9.